Ballard Power Systems (NASDAQ:BLDP) stock is soaring today after inking a $80 million deal with Volkswagen and Audi, giving the automaker fuel-cell-related intellectual property. The deal also extends a servicing contract that BLDP and Volkswagen have for two years, according to Ballard’s news release Wednesday morning. BLDP stock was up as much as 62% this morning before settling to about 50% above yesterday’s close at midday Wednesday. BDLP has a market cap of just $232 million and 2014 revenues of around $70 million, so this $80 million deal with Volkswagen is significant. With a company of that size willing to buy intellectual property, it helps to validate the technology that Ballard has created. Ballard will retain a royalty-free license to utilize the IP transferred to Volkswagen Group in bus and non-automotive applications as well as for certain limited pre-commercial purposes in automotive applications. 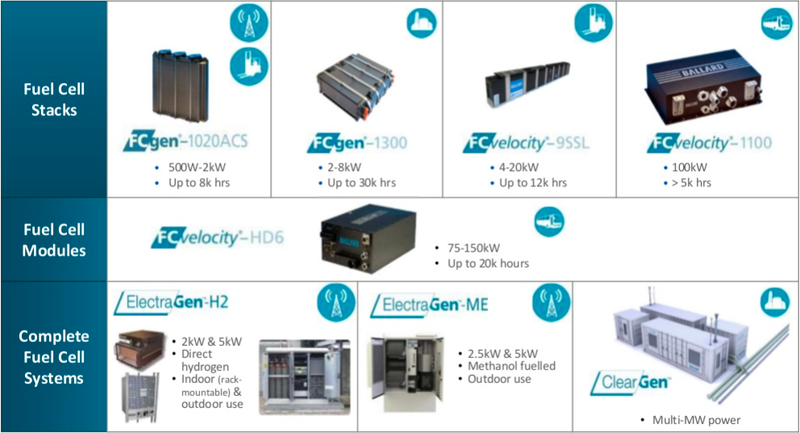 Below is the list of Ballard’s current products, showing the range of applications their fuel cell technology can address. The technical chart for Ballard Power Systems shows that the recent spike higher brought the share price above the downtrend line and above the 100-day moving average. The next level of resistance will be the 200-day moving average at around $3.00. The RSI is oversold after today’s moonshot. 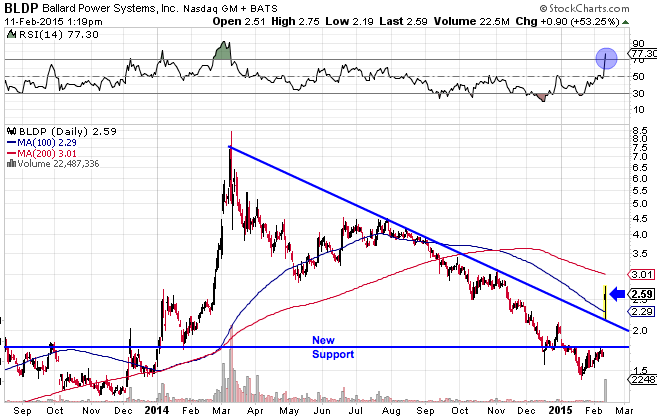 We may see a pullback on profit taking in the next few days, but I like the long-term prospects for this company.